David Yepsen, former director of what is now the Paul Simon Public Policy Institute, had this to say about the Jeanne Simon’s contributions: “She was a pioneering figure in her own right and was considered a true trailblazer. 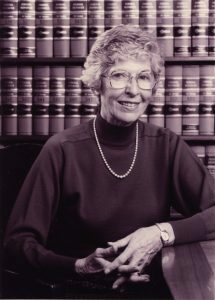 She was one of the few women law students at Northwestern University and one of the first female representatives in the General Assembly.” Although Jeanne Simon passed away in 2000, Paul Simon continued their legacy until his passing in 2003. A longtime Simon friend and former dean of SIU Library Affairs, Carolyn Wagner Snyder, sought a way to honor Jeanne Hurley Simon. Snyder helped establish the Jeanne Hurley Simon Memorial Scholarship to honor her life and legacy.